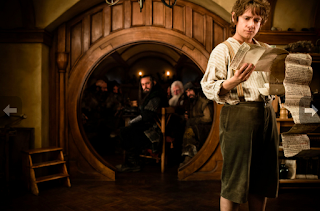 He is into the crunch right now on The Hobbit with recording set to begin in August. That pressure prevents him from being in Ottawa for the performance. Asked whether some of the music for The Hobbit will hint at the Lord of the Rings, he’s coy. It's been quite some time since we've run a Live to Projection review, so big thanks go to Erik Ammerlaan for sending this great review of The Two Towers at De Doelen! After a year, Middle-earth had once again returned to the Netherlands last weekend. 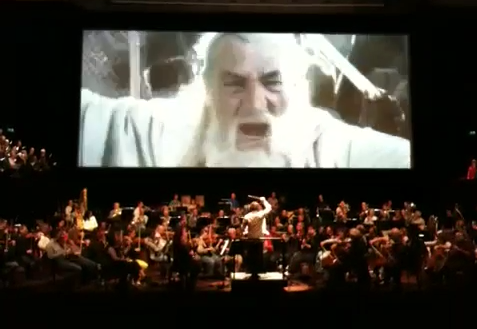 The Two Towers Live in De Doelen concert hall in Rotterdam made Middle-earth almost tangible. 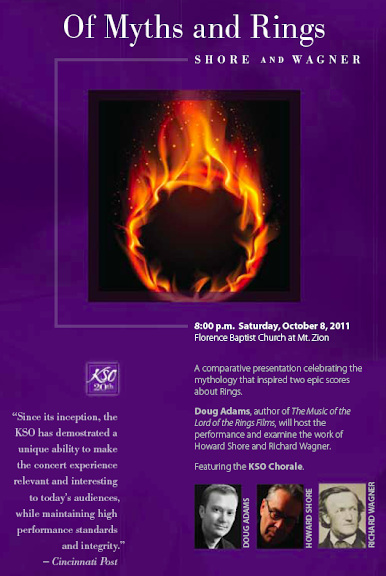 Due to the tremendous success last year, when The Fellowship made its debut, the concert now even ran over three days instead of two. The foyer was buzzing with excitement. At multiple spots one could buy a programme and... The Music of The Lord of the Rings Films. I had already glimpsed that book at last year’s concert and it was after that, that I discovered www.musicoflotr.com and learnt more about the book. This year I was not in doubt and bought it. Further on, a lot of attention was attracted by a stand with Tolkien curiosa like books, helmets and Elven brooches. After having resisted the urge to buy anything, I walked into the concert hall where the musicians were tuning their instruments. Some musicians swiftly had a go at the Isengard theme. Even while tuning it sounded familiar! Finally, Ludwig Wicki entered the stage, whom was given a loud applause by the fans. The concert had a thunderous start with the Balrog fight. Wicki directed the musicians as if his life depended on it and the chorus quickened my pulse. It is unbelievable how the live music penetrates you. The rest of the first half – except The Mearas – was less captivating than last year’s concert. It’s not that it wasn’t good (far from it), but it’s just that I consider the musical material of TTT less interesting than that of the other movies. However, after the intermission, Kaitlyn Lusk and the children’s choir joined the musicians and made the concert an unparalleled performance! One could see that Ludwig and the musicians had a great time as well. It's great that local musicians can bring Middle-earth to life. It’s worth mentioning the setup, because it is different from the concerts in other countries. Because the stage is smaller, the choirs are positioned at the sides of the upper circle. In my opinion, this unique setup makes the concert even better. Because the choir is on the side, they assume some kind of reflecting attitude, just like choirs in classical tragedy. Also, as an audience, one is much more immersed and actually feels a part of the whole. Just like the Fellowship, The Two Towers was an amazing experience. Even the staff at the concert hall was elated because of the nice public and the great ambience. The people really seemed one in spirit. Afterwards, Ludwig Wiki and Kaitlyn Lusk even held a signing session. However, most people chose to quickly go to the queues in front of the cash desk, to advance order tickets for The Return of the King next year. I did not want to miss the signing session though! And what would be more appropriate to sign, than my just bought copy of The Music of The Lord of the Rings? So, the book already holds much value to me now. Ludwig and Kaitlyn were very friendly and really took their time to talk to the fans. Of course, I can’t wait for next year’s The Return of the King, but in the meantime I will enjoy your book. The book is very complete and offers many insights. On top of that, it also looks gorgeous! Certainly a must have for anyone that has the Complete Recordings. 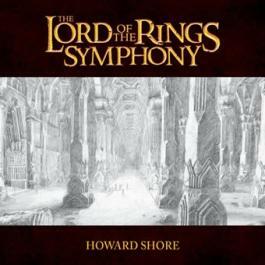 Howard Shore joins this conversation on WQXR's Movies on the Radio via a Skype call from New Zealand around the 42:30 mark. Enjoy! WQXR's Movies on the Radio meets Slate's Culture Gabfest: OnThursday, May 31 at 7 pm in The Greene Space, host David Garland spoke with Slate's Dana Stevens, Julia Turner and Stephen Metcalf about music and the movies, including a conversation about notable recent and upcoming releases. Special features included a "Film Scoring 101" segment and a conversation with Academy Award-winning composer Howard Shore, who participated by Skype from New Zealand. Our discussion is archived below in edited form and will appear on an upcoming installment of the Slate Culture Gabfest.